Trying a ten step skincare routine. Because why be carefree when you can be high maintenance, right? 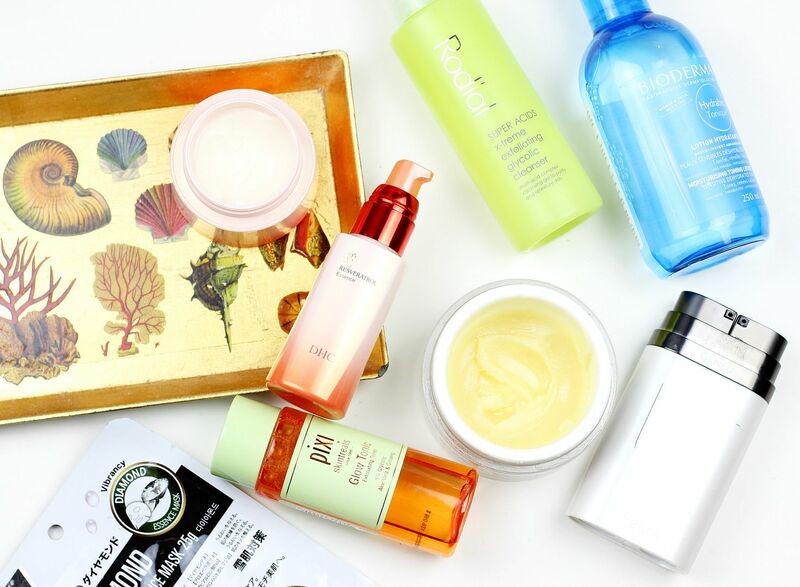 In the first week of January, I got so so interested in korean skincare, and the elaborate ten step skincare routine that seems pretty famous. Ten steps. Ten. So intrigued. After investigating a little further, a ten step routine is not too far away from my regular routine, so I gave it a go every evening for the whole of January. This is my spin on the infamous Korean ten step skincare routine, and although it’s a bit of a faff… my skin is looking pretty good at the moment. Touch wood. Oil cleanser – this is pretty standard. I use my trusty Emma Hardie cleansing balm because nothing else quite manages to make my skin feel so deliciously soft. Apply to dry face, massage for a minute or so and then wash off with a hot flannel. Second cleanse – After all the makeup is gone, I use a second cleanser to really make sure my skin is clean and to treat any current concerns. I love the origins cleansing milk, or the Rodial acid cleanser for when my skin is feeling a little congested. These two steps alone definitely make the biggest difference to the skin when used consistently. Optional step – exfoliate. A couple of times a week, I use a manual, gritty exfoliator to really make sure my skin isn’t too dry. My one and only is the Origins modern friction exfoliator. Tone – I did stick religiously to toning, and I don’t always. It feels nice, but doesn’t seem to add huge amount to the overall experience of my skin. I love the Bioderma toner, and the pixi glow tonic for when I want an acid tone. Optional step – sheet mask. Although I haven’t mentioned sheet masks too much here, I am a little bit obsessed and love using them once or twice a week to give my skin a much-needed radiance boost. Addictive! Essence – An essence is a funny one. Not quite a toner, not quite a serum, it acts as a skin treat. By far the best one I’ve found is the DHC resveratrol essence, as it makes skin feel so intensely hydrated. Serum – I think that a super charged serum is the most important step after cleansing, because the ingredients really get to work underneath the skin. Night cream – Apply a rich night cream, and feel a bit greasy but know that as long as your face doesn’t touch the pillow it will be worth it. I always go to bed looking a bit shiny, and my skin drinks up all the moisture. Eye cream – I constantly have dry under eyes, so I always make sure to apply eye cream to make sure my eyes don’t go too wrinkly. Optional step – add a drop of an oil onto the top of any night cream, because my logic is that oil traps moisture in because oil and water don’t mix and oil always sits on top of water. Science, maybe? Too much faff, or is there no end in the quest for perfect skin? If you liked this post, you might like this post about things my skin is loving right now, or this post about skincare on trial.